This is a Kraft Foods recipe. It’s easy and good. Brown the chicken in an oven-proof skillet. 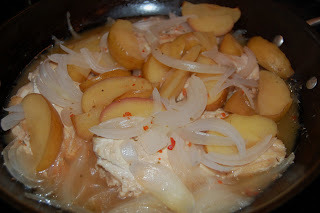 Add the onions and apples. 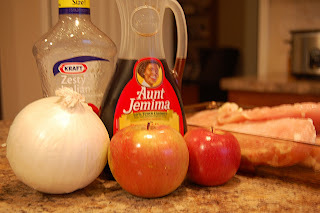 Mix the syrup and dressing together and pour over the other ingredients in the skillet. Cover and finish baking at 350 degrees for about 30 minutes, or until the chickent is done. This would be really good served with rice, using the extra sauce over the rice. Wonder how it would be in the crock pot. That looks great. I love that it doesn’t have a ton of ingredients. What a great combination for chicken! It also looks fairly quick and easy (which I love)! Interesting combination. My children love syrup, love apples, and love chicken. This might work for them! This looks great, I bet it would be really good with pork too. Thanks for the recipe – we tried it, and had mixed reviews. 2 of my kids really liked it, as did I. Daughter #3 didn’t care for it. 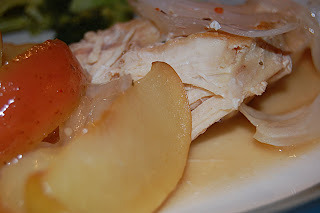 I found the chicken was done well in advance of the apples and onions, so I took it out, tented it in foil, simmered the remaining, and added the chicken back in.